This page contains contributions to the Network Commons book by a range of authors on separate topics and case studies. If you would like to contribute, please email me, Armin Medosch. This article starts with a short introduction to free networks, followed by a summary about free networks in Latin America. The article then tells in more detail the story of two attempts at making free networks in Chile, in both cases linking the idea of free networks with specific artistic and socially engaged goals, reports Ignacio Nieto, who has been involved in both projects. Free networks have made possible new alternatives that allow it to think about autonomy from the commercial ISP system and be able to share information between peers and on an equal basis. Free servers have allowed creating services on the Net which aren’t determined by the commercial interest, and which are not governed by the desire to control information. However, they have also led to the overcrowding of the spectrum for IEEE 802.11 technology. In 2001, “NYCwireless” has been created, as a nonprofit organization that promoted and enabled the growth of free, wireless, public access to the Internet in the city of New York and surroundings. Several free networks have emerged with similar objectives, both in Latin America and in the world. Standing out is Guifi.net, for its rapid growth, a project which began to take shape in 2004 near Barcelona. On November 17, 2006, the National Youth Council of Catalonia gave to guifi.net the award for most innovative partnership project, as a pioneering project which enabled new forms of participation, beyond offering free Internet. Guifi.net provides resources to the community and interconnects the rural world, while bringing closer young people to new information and communication technologies. In the year 2008 was legally established a Private Foundation for Open Network Free and Neutral, Guifi.net as a platform for collaborative R & D, and as a forum for institutions, organizations and companies interested in participating in a global project for the development of infrastructure and network services. The development and growth of these communities resulted in the development of free software, focused on replacing the factory firmware routers to allow greater control and the ability to incorporate new features. In early 2004, based on a Linux kernel, appears the first release of OpenWRT. Currently it has a repository system that installs around two thousand applications and there are versions for a lot of different architectures, compatible with various routers and inexpensive computers. This facilitated the emergence of several derivatives projects which have contributed to the development of the state of art. There are several algorithms of Mesh routing, among others: OLSR, BATMAN, PA-SHWMP. Currently open source developers have a struggle to find the best routing protocol, that’s why they meet once a year in http://battlemesh.org. In Latin America, the creation of collective oriented implementation of free networks began to settle early in far more precarious circumstances than in the so-called first world countries. One of the first cases of which it is known is Buenos Aires Libre, also known as "BAL", originally the group was called WirelessZonaSur and was then known as FreeBaires. Although there is little clarity about its foundation, it was apparently circa 2001 that it started developing as "Buenos Aires Libres" (BAL), with the objective of implementing a data network, free and community-based, for the City of Buenos Aires and its surroundings, connected with services like Wikipedia in Spanish, including community-based services. Jointly with the installation of nodes, BAL conducts outreach and training, where gets taught the building of antennas with household items. They have participated in events like "Wikimania" (2009) and Free Culture Festival "Fabrica de Fallas” (Failures Factory), organized by Radio La Tribu since 2008, and have contributed to the emergence of other free networks as: FerNet, Rosario, MontevideoLibre or LugroMes, who have excelled in the developing of firmware Nightwing , and have recently collaborated to develop a version that can meet the specific needs of BogotaMesh, a free network that have his reference before with Andres Burbano, the first free network project in Bogota in 2007. In 2010, BAL organized the first Jornadas Regionales de Redes Libres (JRRL, Regional Conference of Free Networks) in which free networks from Argentina, Uruguay, Brazil, Chile, Colombia and Paraguay meet. During the II JRRL, made in Tacuarembo, Uruguay, it began work on the preparation of the manifesto of Latin American free networks, which was finished and presented publicly in the III JRRL, conducted within the framework of the 12th International Free Software Forum (FISL) in Porto Alegre, Brazil. This event also included the participation of Elektra, B.A.T.M.A.N. (Better Approach To Mobile Ad-hoc Networking) developer, among with Rodrigo Troian from RedeMesh (Brasil) and Hollman Enciso from Bogotá-Mesh. Together, they traveled to Santiago, Chile, to deploy an open network using mesh routing protocol BATMAN-adv, in a community called La Victoria, “The Victory” the first occupied area in Latin America. We established our base station in Channel 3, a pirate television UHF frequency station that began their transmissions during the late nineties. The station`s editorial line is left-leaning, connecting with the 70`s in Latin America. This particularity mixed up with the idea of centralized signal transmission was why we choose it. We proposed a project for FONDART, the National Funds for the Arts of Chile, and we won it. We installed 5 nodes in different houses in La Victoria area. The project, that was funded focused on the transmission on digital video within an Internet portal. Any person in reach of the radio signal of these free network nodes could access to the web portal and see and hear the videos transmitted from Channel 3. Elektra, from B.A.T.M.A.N. protocol funded by FONDART, was invited to work technically to install the network. A mesh network was working in the winter of 2010 in La Victoria. We could “see” all nodes and also the web portal, but we couldn’t transmit video from Channel 3. Elektra left it in that state of the art, and afterwards the person in charge conducted bad management, taking the money of the project for his own purpose. So the group that was working on the mesh network broke up and the mesh network was abandoned. A second free network project was run when the curator of Encuentro de Cultura Digital (digital culture gathering) met Elektra in Berlin. The curator spoke with me and we decided to invite Elektra again, funded by the Chilean government state department of New Media. We established our base in Espacio G, an alternative gallery hacker space in the city of Valparaiso. One of the curatorial ideas was to work with the people who had lost everything with the fires during the summer of 2014 in Valparaiso. So a prototype was done and installed in two community centers and two houses in ButterFly Hill. Technically speaking, the network was based on an infrastructure which combines antennas, softwares, and a social network that can be freely used. In the sense of the context the installation of these network up on a hill broke typical communication flows. Topologically people, who live in the hills, usually have to go down to communicate in a verbal or non verbal way. All the services of the city (school, stores, baths, etc) are down the hill, far away from the places we installed the network. This produced a new form of communication that impacted directly oin the way how the city was organized, generating new forms of activity that having nothing to be with other urbanized public or private spaces. Technically speaking, these technologies are difficult to install, manage, support and train. Chile isn't a rich country, and especially the community who works in these projects, have no free time to work in this network, in a contextual issue. In the first case, technically speaking it was impossible to transmit digital video to the community, the mesh network was too weak, besides we got economic problems that broke the group and we never saw and prepared a final document to give back to the FONDART evaluators. In the second case, Mariposa Hills are far away from Espacio G and we haven’t had any money support to go on with the project. Also, people at Valparaiso weren't motivated enough to go on with the project; the distance is too great and the community of hackers in Valparaiso is a very close-knit community. As for myself, I live in Santiago, so it was quite expensive for me go there and work for free. recently I had the opportunity to visit Cuba as a tourist. I would like to use this opportunity to send you a letter. I really do not want to be seen lecturing two great leaders such as you, by offering my unasked advice, but my suggestions are simple and constructive as you will see, so please take the time to read this letter. First of all, my heartfelt congratulations for the release of the three heroes from the Cuban Five. This is indeed a victory and a recognition of Cuba's independence and right to self-determination. I happened to be in Cuba when that announcement was made. That day, we traveled from a tourist hotel in Varadero to Playa Larga/Caleton, at the Bay of Pigs, also known as Playa Gíron. In Varadero, staff were running together in front of a large flatscreen television showing Telesur TV - the Cuban CNN. We could understand what was going on by reading the scrolling subtitles. This was truly a historic date. We were traveling as tourists as I said, and I have not done any substantial reading on Cuba, I will openly admit. Neither as a journalist nor cultural theorist I am a Cuba specialist. And I was not going to comment on those big historical dates either. I just wanted to provide some way of expressing my gratitude of having spent three weeks in a wonderful country with wonderful people. We enjoyed our holiday tremendously and surely will be coming back. But between all the bliss of Sun, Sea, Salsa (the music and the food) we found one thing lacking. This was the Internet, particular in its wireless form, through WiFi or WLAN. The Internet, if it was offered, was always locked into a room, which can be unpleasant in a hot country. It was also expensive, and slow, if it worked at all. The “expensive” point is maybe the least important one, but since this is more of a matter of principle, allow me to make a proposition. The Internet is not to be treated just as any other commodity. It is, like with Marxism itself, something that does not become less by getting used. Through its usage, it becomes more valuable, because it allows people to exchange information directly and engage in unfiltered, two-directional people-to-people communication; it also gives people an opportunity to access wide areas of knowledge and to learn about contemporary affairs as well as study history. The Internet gives those with less power a chance in many different ways; they can communicate directly from remote places with people all over the world and get their message through, just like the Zapatistas did in Chiapas in the 1990s, sending messages directly from the Lacandonian jungle to the world. The Internet is not a commodity like any other commodity. I would like to thus add a recommendation. 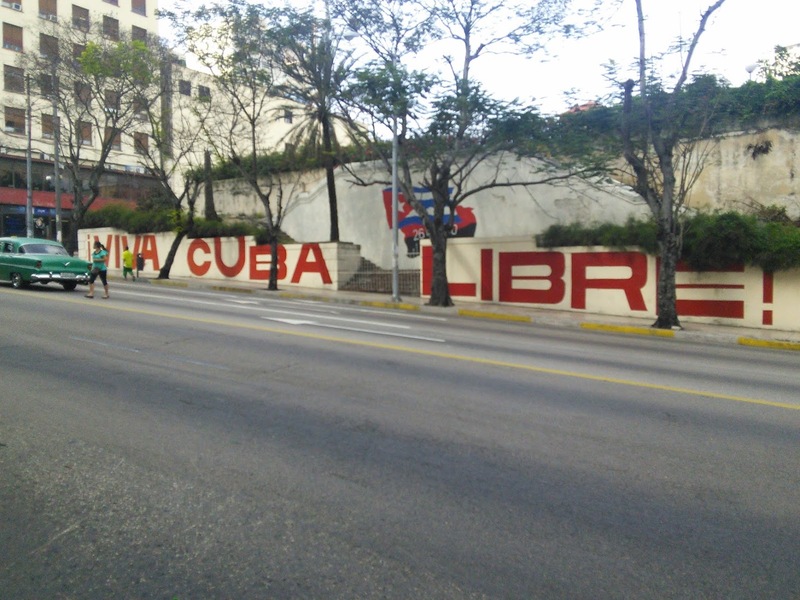 In order to further the Internet in Cuba, and give Cuban people a fair chance in the globalized world, the techniques of free wireless (and wired) community networks could be applied. Those projects are taking the principles of agricultura urbana to new technologies. Worldwide, currently there exist several movements for the creation of free networks - wireless community networks as a self-provided Internet. One such group is Guifi.net www.guifi.net who originated from Catalonia, Spain, and are now operating all over Spain and beyond. Here, people use ways of pooling their skills and some small fundings for materials, to build wireless Internet in the sky. With such methods, large scale networks can be made, shown by many examples such as Guifi, Freifunk in Germany, Ninux in Rome and Italy, Athens Wireless. There are now examples also much further South, such as Valparaiso Mesh. These networks operate like cooperatives, pooling their resources to have cheap wireless broadband. In some cases it has shown more interesting to lay fiber optical cable, also as part of a community network which is shared as a “commons”. This idea of the pooling of resources in the network commons has emerged directly from the capitalist core. It is one of those “events” in history which confirm the idea of Marx and Engels, that the capitalistic revolution of the means of production creates the condition for the social revolution. The network commons creates conditions for capitalism to surpass itself. So in its dialectical movement, capitalism creates the conditions that allow the network commons to emerge, but then it also fights it. On one hand, the network commons in particular and the wider free and open source software movement in general, represents the surplus of the utopian values of liberal capitalism, on the other hand it points at a stage surpassing it. This possibility of surpassing is fought by the conservative forces within capitalist societies. So they try to hinder it, by using all kinds of laws and measures, like copyright, surveillance, from fully developing, and thereby stifle and undermine the potential which the free exchange between people may have had. But I am convinced that the community based method of network deployment is the best for Cuba, in particular with regard to cost, resilience and people's participation. Those community networks, because they are built and maintained by their users, tend to be quite resilient during natural disasters. They are also resilient in case capitalist infrastructure breaks down, due to the crisis-prone mode of development of capitalism. They allow people to organise their own telecommunications and therefore make digital networks more transparent to its users. If there is any idea that Cuba might adopt such a community based model, I am sure, the activists from cooperative wireless networks everywhere will be happy to give advice. I personally can not offer any practical support, as I am a writer who chronicles those developments (see http://www.thenextlayer.org/NetworkCommons) ; by letting you know these things I am not following any commercial interest. If necessary, I can help to get in contact with the right people from the free wireless movement.